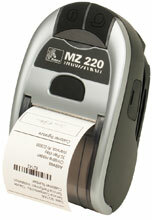 Zebra iMZ220 - 2" print width, 128MB/128MB, US/Canada English, Wi-Fi (802.11a/b/g). Works with Apple iOS (iPad, iPhone, iPod). 2" x 660" Direct thermal 3.2mil Receipt Paper. Compatible with Mobile Printers. Continuous Roll. Single roll. Does not require a ribbon. Also available as a case (Part# 10011043). 2" x 960" Direct thermal 2.4mil Receipt Paper. Compatible with Mobile Printers. Continuous Roll. Single roll. Does not require a ribbon. Also available as a case (Part# 10011041). The Zebra M2I-0UN00010-00 is also known as ZEB-M2I-0UN00010-00	or M2I0UN0001000	.